Vancouver personal injury law firm Simpson Thomas & Associates is a pioneering firm in BC’s legal community. From being the first firm dedicated to motor vehicle accident claims to trailblazing structured settlements, the firm has a lengthy list of firsts to its name. We were recently tasked with ensuring that the firm’s stellar offline reputation would carry over into online brand awareness. To achieve this goal, we focused on the firm’s language capabilities using the Google Display Network. Because brand awareness campaigns are best suited to short creative bursts designed to capture — at least for a moment — the increasingly short attention span of the internet audience, we started with a display campaign focused on wishing Vancouver’s Chinese community a Happy New Year. One of Simpson Thomas & Associates largest assets is the fact that they are a multilingual law firm. In a city where the majority of the population speaks English as a second language, the strength of having legal counsel who can converse in Punjabi, Mandarin, Cantonese, Korean, and Vietnamese cannot be overstated. To take advantage of this competitive edge, we decided to create a series of online brand ads focused on these individual language groups. The first ad that we created in this language-specific campaign was targeted at the Mandarin and Cantonese populations in Vancouver and focused on the upcoming Chinese New Year and, more specifically, the beginning of The Year of The Goat. 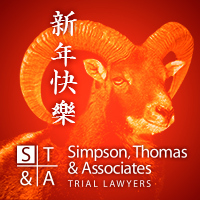 This ad was run on the most popular Chinese language sites in Vancouver at a fairly high volume in order to expand Simpson Thomas’ brand identity with a consumer segment that was previously targeted by the firm on a fairly limited basis. By focusing on an upcoming cultural event, we were also able to increase the likelihood that an interested party would click on the ad. Based on anecdotal observations and empirical studies, an ad is far more difficult to ignore when it is based on an occasion that is top-of-mind. In short, by looking at a relatively underserved niche demographic in a fiercely competitive market and focusing our creative on an upcoming cultural event, we were able to provide Simpson Thomas with a digital edge over their competitors.